Stoomvaart Maatschappij Zeeland was founded in June 1875 and opened a service from Flushing to Sheerness in Kent on July 26 of that year. However, poor support led to the service being suspended for the following winter and re-opened on May 15, 1876 to nearby Queenborough. The Dutch port remained Vlissingen (Flushing) until after the Second World War, when it transferred to Hook of Holland. 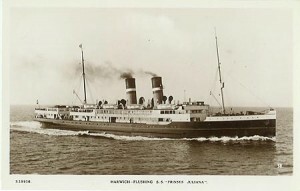 In 1927 an agreement was reached with the London and North Eastern Railway to switch the service to Harwich, and that agreement was further enhanced in 1946 after World War II when services were moved to the Hook of Holland, the company’s facilities at Flushing having been destroyed during the hostilities. In the meantime, British Railways had taken over from the LNER at Harwich in 1948 and the service evolved to a full co-operation, the two companies providing the night [B.R.] 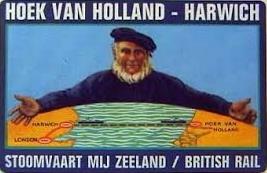 and day [Zeeland] services respectively employing four ships plus two relief vessels. 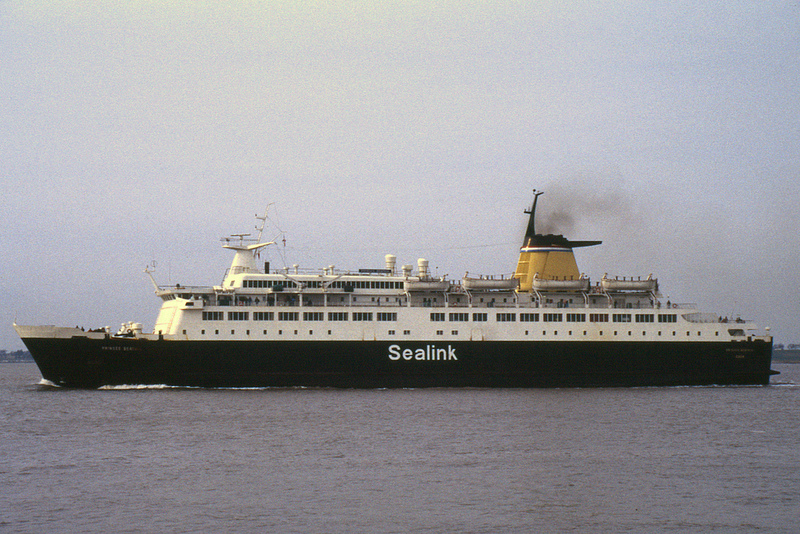 In 1968 with the introduction of car ferries, the SMZ and Sealink services were fully amalgamated, and in 1989 Swedish ferry operator Stena Line acquired SMZ. The following year Stena Line also acquired SMZ’s UK partner Sealink. 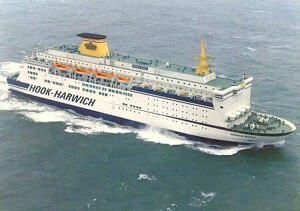 The Harwich operations of Sealink were transferred to Stena Line BV. Koningin Beatrix was built in 1986 by Van der Gissen De Noord, for Stoomvaart Maatschappij Zeeland N.V. She was used on their joint Harwich-Hook of Holland service with Sealink. The SMZ service was marketed as Crown Line. In 1989, the SMZ operation was sold to Stena Line BV. Ownership of Koningin Beatrix passed to Stena Ab, and she was chartered to Stena Line BV. In 1997 she was transferred to the Stena Line Fishguard-Rosslare route, when replaced by HSS Stena Discovery. In 2002 she was transferred to the Karlskrona-Gdynia route and renamed Stena Baltica, swapping with Stena Europe. 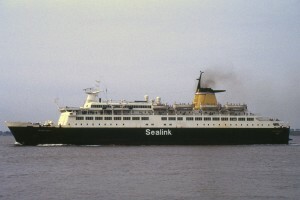 In 2003 the Koningin Beatrix was transferred to the Karlskrona – Gdynia route and renamed Stena Baltica. In 2005 the Stena Baltica was rebuilt at the Remontowa yard. The SEK 235 million. Investment included the refurbishment of the passenger facilities on decks 7, 8 and 9. A new vehicle deck was created from stripping the cabin accommodation on decks 5 and 6. Externally, a large vehicle door and ramp was constructed at the bow and number of lifeboats were also removed. The Stena Baltica and her running partner MS Finnarrow were replaced on the Karlskrona – Gdynia route in 2010 by the Stena Vision and Stena Spirit. The ship was laid up in Lysekil. On the 24.th of January 2013, Stena announced the sale of the ship to SNAV. In February 2013 the ship was sold to SNAV, renamed SNAV Adriatico, and started the service by operating the route Ancona – Split. 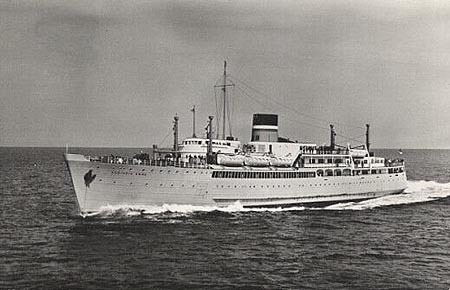 Built as a civilian passenger liner in 1939 by De Schelde at Vlissingen, she was named the MS Koningin Emma, after Queen Emma of the Netherlands and operated between Flushing and Harwich. After fleeing to Britain after the German invasion in 1940, she was requisitioned by the British Ministry of War Transport, renamed HMS Queen Emma and converted to a troopship at Harland and Wolff’s yard in Belfast. During the war her main role was transporting British Commandos, and she participated in the Lofoten Islands Raid and the Dieppe Raid. She had the advantage of a high speed that allowed hit and run operations. 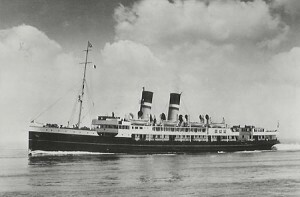 In 1946 Queen Emma was returned to her owners and continued to operate as ferry from the Hook of Holland until 1969, when she was scrapped in Antwerp, Belgium. Built in 1967 by Cammell Laird of Birkenhead as Koningin Juliana for Stoomvaart Maatschappij Zeeland of the Netherlands, it was used on the Harwich to Hook of Holland route until 1984 until sold to Navarma Lines and renamed Moby Prince. At 22:03 on April 10, 1991, the Moby Prince left Livorno, heading to Olbia for a regular service, manned by a complement of 65 crew and 75 passengers. The ship was commanded by Ugo Chessa. While taking the usual dedicated route out of the harbour, the ferry’s prow struck the Agip Abruzzo, which was standing at anchor, and sliced through its tank number 7. The tank was filled with 2700 tons of Iranian light crude oil. At 22:25, the ferry’s radio operator broadcast a Mayday from the portable VHF transmitter. The charred hull was moored at Livorno until 17 May 1998, when she made water and sank. The rusty wreckage was later raised and towed to Aliaga, Turkey to be scrapped. The sinking of the Moby Prince was the worst disaster for the Italian merchant navy since the end of World War II. Built for the Hook of Holland-Harwich day service Koningin Wilhelmina II was delivered in January 1960 from the De Merwede shipyard in Hardinxveld. Fitted with a bow thrust unit and stabilisers, the ship was as modern as her futuristic appearance suggested – except for the fact that she was primarily a passenger, rather than a vehicle, ferry. Although the ship was actually built with a small side-loaded car garage with space for 45 vehicles, the Hook-Harwich route was still very much geared towards the large numbers of often train-connected foot passengers rather than motorists. At this time the original agreement, as reached between SMZ and the LNER in 1927 when the former had moved their services to Harwich from Folkestone, was still in force, with the Dutch ships covering the day services with the British operating overnight. Joined on the route, operating the night service, by British Railway’s Avalon of 1963, this pair was the final ‘classic’ passenger-only ships for the Hook of Holland service, and were relegated to secondary status with the 1968 delivery of the new purpose-built car ferries St George and Koningin Juliana. 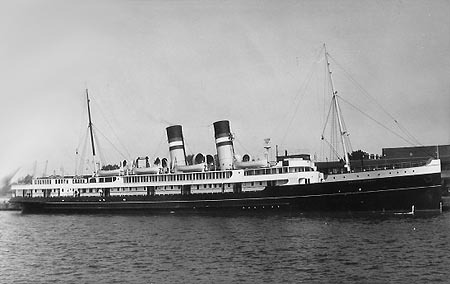 The Koningin Wilhelmina subsequently operated as a reserve ship as well as providing peak season support and extra sailings. 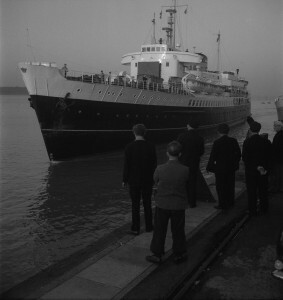 This continued until 1978 when the new Prinses Beatrix was delivered and the ‘Wilhelmina’ was finally retired on 28 June. Sold to the Greek Ventouris family, renaming her Captain Constantinos and deploying her on their Piraeus-Syros-Tinos-Mykonos route. 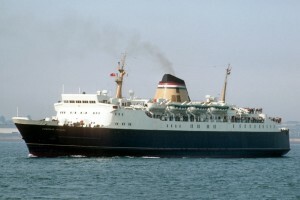 She was further renamed Panagia Tinoy in 1981, remaining with Ventouris Sea Lines. Finally replaced as a ferry in 1994, the ship was retained and transferred for operations as a day cruiser based in Crete under the name Artemis. With the collapse of Ventouris in late 1995, the ship was acquired by Minoan Cruises and retained on her Cretan cruises. The end finally came in early 2001 and she fairly speedily arrived in India for breaking under the shortened name Temis. 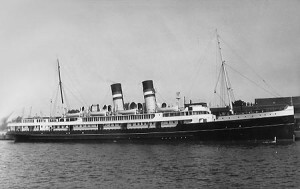 SS Mecklenburg II was transferred to the Flushing -Harwich route in 1927 were she remained until 1939. She returned to operate the Harwich-Rotterdam route from June 1947 until July 1949 .Mecklenburg II was scrapped on the 13th May 1960 at Van Heyghen Freres S.A, Ghent. 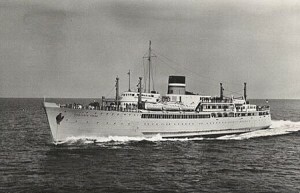 In 1953 the 44 year old Oranje Nassau was chartered during the summer period to operate extra sailings. She left lay-up at Schiedam on 17th of July and operated just seven roundtrips, departing Harwich on Fridays and the Hook of Holland on Saturdays. During the week she remained on the British side and made her final arrival at Harwich on the morning of 30th August 1953 after which she proceeded directly to Schiedam for lay-up. 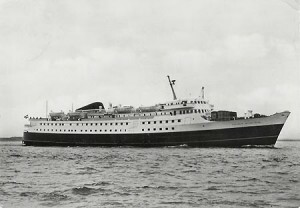 Oranje Nassau was sold for scrap on the 10th July 1954. The new motor ships Koningin Emma and Prinses Beatrix escaped to England on 10th May 1940. The 1939 twins were renamed Queen Emma and Princess Beatrix by the Royal Navy, and during 1942 they took part as landing vessels for the commando raids. Koningin Emma and Prinses Beatrix were rebuilt and refurbished for civilian service in 1947 and 1948, and in the latter year, they took places on the day service from the Hook of Holland to Harwich. In September 1968 the Prinses Beatrix was laid up in Schiedam before being scrapped on the 19th December the same year. Built in 1978 by Verolme Shipyard, in Heusden, The Netherlands and worked for Stoomvaart Maatschappij Zeeland on their joint Sealink route between Hoek van Holland and Harwich, Parkeston Quay. She was named and launched by H.R.H. Princess Beatrix on 14 January 1978. Brittany Ferries bought the ferry on 1 October 1985, and after chartering it for a year back to SMZ, renamed it Duc de Normandie, operating between Portsmouth and Ouistreham from 5 June 1986. 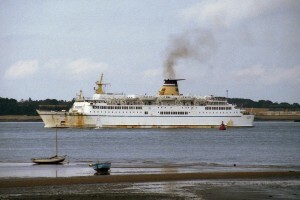 She ended her Brittany Ferries career on this route, her final sailing being on 30 September 2004. Currently running Algericas-Tanger under the name “Vronskiy” for Transmediterranea. 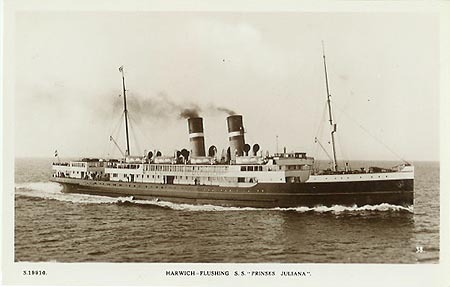 Prinses Juliana II transferred to the Flushing – Parkeston Quay route in 1927 and was bombed by German aircraft on the 12 May 1940 whilst taking troops from Flushing to Ijmuiden and later broke in two. 01/04/1984 Transferred to Admiral Shipping Ltd, Nassau, Bahamas. 11/1985 Sold to Stena Ab, Gothenburg, Sweden. 23/11/1988 Sold Adriatic General Sh Liberia Renamed Marko Polo. 1994. Compagnie Marocaine de Navigation.